Military power as a subject of study has received scant attention in India. Yet, as this book contends, such power has always played a decisive role in the shaping of history in India right from the time of the ancient epics to as late as the India-Pakistan War of 1971. Military means have been largely responsible in deciding the fate' of many contending powers in India-the victory of the Turks over the Rajputs, for example, or that of the British over the Moghuls, Marathas and the Sikhs. This study by a scholar and erstwhile member of the Indian army covers the period of the conquest of India by the British East India Company from the Battle of Plassey in 1757 to the Revolt of 1857. More specifically, it examines the role, within this span, of the most potent weapon system of the armies of those days, the artillery. The author looks at how and why the Indian artillery declined while the British went from strength to strength. 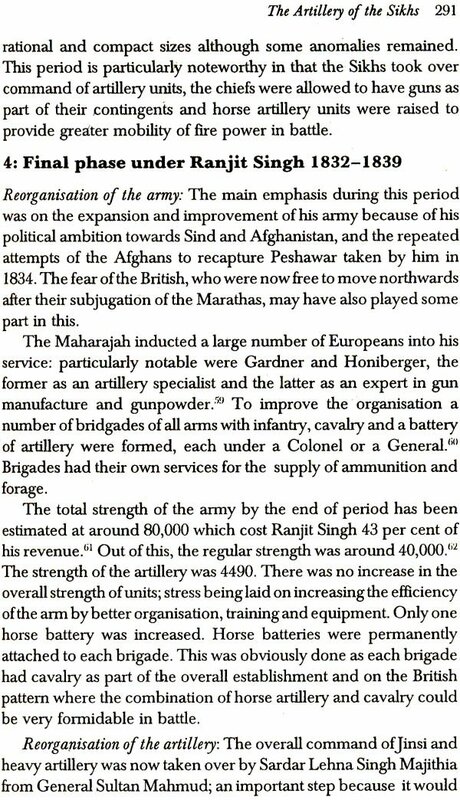 Tracing the introduction of the artillery from the time of Babar, it examines its history up to the time of the British, and its disbanding after 1857. Brigadier Romesh Butalia was commissioned in the then Royal Indian Artillery in October 1944 and shortly thereafter was posted to a field regiment participating in active operations in Burma and Malaya. With this early initiation to the challenge of battle, he volunteered for the Second Airborne Division on its raising and after successfully qualifying as a paratrooper, served in the 17 Parachute Field Regiment, with which unit he participated in active field duty during the 1948, 1961 and 1965 operations in the successive ranks of Captain, Major and Lieutenant Colonel. Alongside, Brig. Butalia became the most experienced air operations pilot in the army. After qualifying as an air operations pilot in the United Kingdom in 1948, he logged over 35,000 hours of flying in various types of aircraft. An able instructor he initiated many young officers in the interest of flying and to him goes the credit of planning and raising the entire schedule and system of the present comprehensive and self-contained training in air operations duty imparted to artillery officers. He also conducted numerous trials on the Cheetah helicopters prior to their approval for use in air operations duty. Brig. Butalia successfully commanded a mountain artillery brigade during the 1971 operations and held the appointment of Commander Corps Artillery of a major corps before his retirement from army service in September 1975. His rich flying experience interspersed with proven achievements in battle and other sensitive missions made him a clear choice for command of Parachute Training School, a school of the Special Frontier Forces, an appointment he assumed in 1976. In 1979 he was given the additional responsibility of raising and training a special commando group which he carried out with characteristic enthusiasm and sense of perfection. He retired from re-employed service on 30 September 1983. Brig. Butalia received the Ati Vishist Seva Medal (AVSM) in 1985 for rendering services of an exceptional order. He died in 1993. It has been said, with some truth, that the only thing more difficult than putting a new idea into a soldier's mind, is getting an old one out. There are good reasons why, but a little realised fact is that in the absence of historical records or indeed credible histories, most tradition is based on stories that have been passed on and embellished, over time, till it becomes difficult to separate truth from hearsay. The dearth of artillery historians and analysts has resulted in, at times, a completely biased presentation, coloured very often by the perceptions and frustrations of the analyst. Often enough, in the urge to develop an attitude or strengthen an argument, veracity becomes a casualty. Romi Butalia was a flight commander in our squadron in the fifties. Even then he was our mentor, with a wide-ranging mind and a need to discover why something happened. Over the years that attitude developed and after he retired he devoted most of his time to what became a labour of love-the history of the Regiment of Artillery. I am privileged to write the foreword to his endeavour covering 1757-1857. Arguably, this was the most critical period in our evolution as a nation and as a people. This is a meticulously researched and cross-indexed book; which seeks to unravel the early history of the artillery in India. In the process, he has investigated some common myths about our prowess in the days of the Mahabharat and has concluded, with justification, that the artillery made its debut as a weapon of war in the fourteenth century. There was some knowledge of naphta and the propulsion of projectiles earlier, but it was only in the mid- fourteenth century that the artillery started evolving as a major player in. the field of battle. It is a fascinating journey and I was enthralled by some early anecdotes and facts. This is no dry-as-dust history but the stuff that dreams are made of, on one level, and a pragmatic and balanced unfolding of a major weapon of war on the other. Babar met with artillery opposition and noted that soldiers in Bengal were expert artillerists as early as 1529. The history of India has been overwhelmingly influenced by force of arms. While deceit, intrigue and political chicanery have played their role, the final issue of who was to rule was always decided on the field of battle. Unfortunately, the study of military history has never been given the attention it deserves either because of constraints on research, or possibly, due to the lack of a national perspective. Brig. Butalia's next project was to further research the period in question and to bring out a book with sketches and maps and to describe in more detail the more important battles he touches on in passing. I can only hope the project will be pursued by the ICHR, for such a book will be of immense value to help us, as a people, to discover the soul of our nation. The military factor has always played a decisive role in the shaping of history in India, from the time of the ancient epics to as late as the Indo-Pakistan war of 1971. The rise and fall of any contending power in India has been mainly decided by military means, which in turn have influenced other aspects, whether social, cultural, economic or political. The victory of the Turks over the Rajputs, the Mughals over the Turks, the Marathas over the Mughals and finally the British over the Mughals, Marathas and Sikhs was mainly because of the superior application of military power on the part of the victors. Dr. Prasad also draws attention to the fact that the weapons used in decisive battles of the eighteenth and early nineteenth centuries have received surprisingly little attention and there is no worthwhile study of the different armies from this viewpoint. While there are a few books that describe the various types of weapons used in India from ancient times to the middle ages, these are mainly descriptive in nature and no attempt has been made to analyse how particular weapons were introduced in battle, how they evolved in warfare, etc. This study attempts to fill this lacuna by focusing on our military history to show how weapon systems can be critical to the outcome of battles and can, in turn, change the history of a country. This study covers the period of the conquest of India by the British East India Company from the Battle of Plassey in 1757 to the Revolt of 1857. Dr. S.N. Sen, an eminent military historian, has remarked that "their [British] Artillery among other things ensured the supremacy of the English in India." There has never been any doubt that the British conquered India and retained power by the application of military might and that they kept control of the artillery in their own hands from 1748 onwards (when regular artillery units were raised by the Company to as late as 1935 when Indians were again permitted-in small numbers-to man their guns). To keep their supremacy in this area the British did their best to ensure that Indian powers were kept ignorant of the art and science of artillery in battle. They even went to extremes in not allowing their own Roman Catholics to man this arm although they were permitted to serve in their infantry and cavalry. The current study covers the most potent weaponry system of the armies of those days, the guns manned by the artillery, an arm of which Napolean said, "It is with artillery that war is made", and one which Stalin, as late as 1944, called the "God of War". The artillery's armament, tactics and handling by the British and Indians has had a marked influence on our history. Indians were not neglectful of the importance of guns in battle. 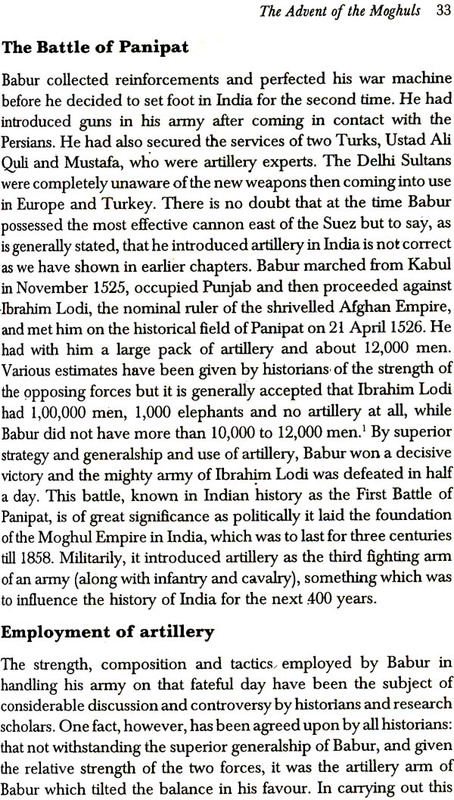 As early as 1526, Babar won the battle at Panipat by use of his artillery and superior generalship. The outcome of this battle was to change our history for the next 300 years. In due course, the Mughals lost their empire to the British, partly because they could not face the superior handling of artillery by the British. Akbar called his guns the "locks and keys of empire".' 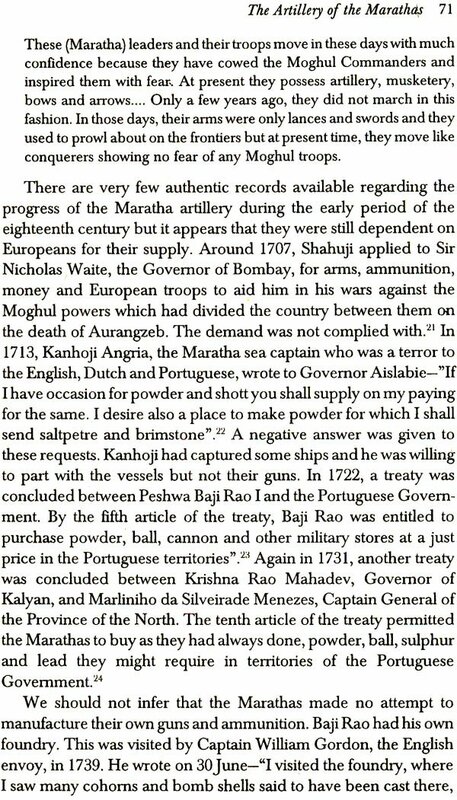 Under French officers the Marathas had brought their artillery arm to a high standard. 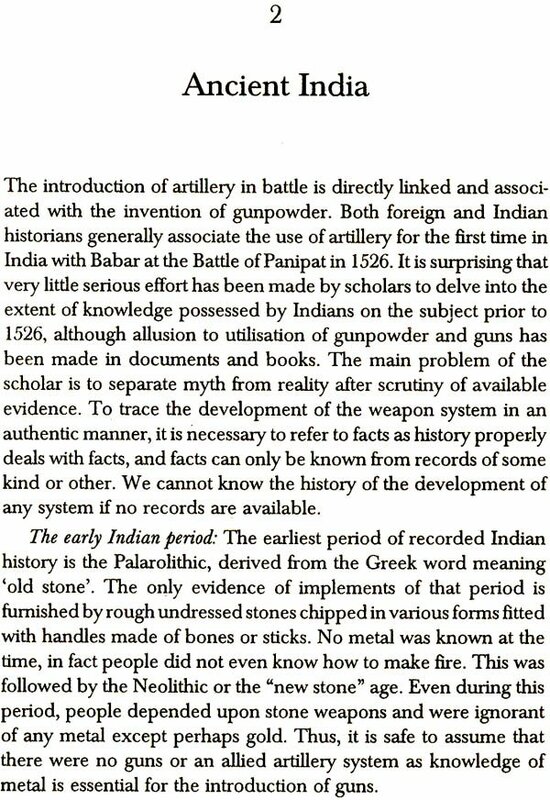 Another notable Indian military historian has remarked that the Marathas were obsessed with the belief that artillery was everything in war." Under Ranjit Singh, the Sikhs had brought up their artillery to a high peak of battle efficiency under French experts, but after the death of Ranjit Singh they lost the fine tactical sense of its employment and with it lost their empire due to inept handling of the artillery at their final battle with the British at Gujrat in 1849. This battle has been called the "Battle of Guns", as the issue was decided by the artillery arm of the British within the first three hours. (a) The concepts, insight and philosophy of the British and Indians on the role of artillery in battle prior to 1757. (b) The state of development of guns, ammunition and related. equipment of the British and Indians prior to 1757. (c) The state of development of the artillery arm of the British and Indians prior to 1757 covering aspects of the organisation, tactics, morale, training and armament. (d) The role of the artillery of the British in their conquest of India from the Battle of Plassey in 1757 to the revolt of 1857, highlighting its achievements and failures in important wars of Mysore, Marathas, Sikhs and the revolt. (e) The evolution of the artillery of the British from 1757 to 1857 and the reasons thereof. (f) The role of the artillery of the Indians in their wars with the British from 1757 to 1857, highlighting its achievements and failures. 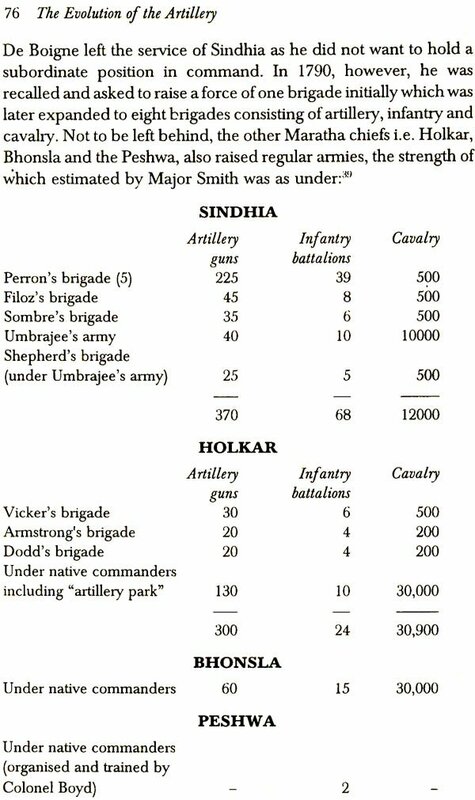 (g) The evolution of the artillery of the Indians from 1751 to 1857 and the reasons thereof. (h) The influence of the artillery arms of the British and Indians on the shaping of Indian history from 1757 to 1837. (i) The influence of the artillery arms of the British and Indians on the shaping of Indian history from 1757 to 1857. (j) The role and influence of the artillery of the British and Indians on the outcome of the revolt of 1857. (k) The influence of weapon systems on the shaping of history. This study attempts to bring out how weapon systems can have a marked influence in the shaping of history. It shows how, notwithstanding faith in victory when fighting for religious or other just causes, "God fights on the side with the best Artillery", a much quoted axiom which some nations tend to ignore and go to war expecting to win as they feel and believe that they are fighting for a cause. The British managed to conquer India not because they had any specific religious belief or any other principle that guided them, but because of their all-round military superiority in which their artillery played a most critical role. Prior to the First Battle of Panipat and Babar's invasion in 1526, Indian armies consisted mainly of cavalry, infantry and elephants. A few guns were held by them but these had no impact in battle as their use was ill understood. It was Babar who introduced the artillery as a fighting arm. The Mughals were able to conquer other Indian powers by using this new arm; nonetheless, their understanding of the true role of the artillery and the need for cooperation of all three arms was defective. Tactics were allowed to drift and warfare remained a tumultuous affair. They either relegated the artillery. to a secondary role or had far too much faith in its role as "God of battle". As Irvine has stated, "All respectable Indians preferred to fight on horseback only. Infantry they despised and in artillery they never became proficient". The Indian powers, in various battles against the British, invariably outnumbered the latter in all three arms but were defeated by the firepower of the British artillery combined with the manoeuvre of cavalry and infantry. A notable fact of our military history and one which has received scant attention is that for the first 50 years from 1748, when the British started raising their regular armies, to 1799, and the fall of Seringapatam., the British had very little cavalry force and all their victories were achieved just by a combination of artillery firepower and disciplined infantry against Indian powers who had a preponderance of cavalry. The British started raising their cavalry much later, after the Anglo-Maratha wars. 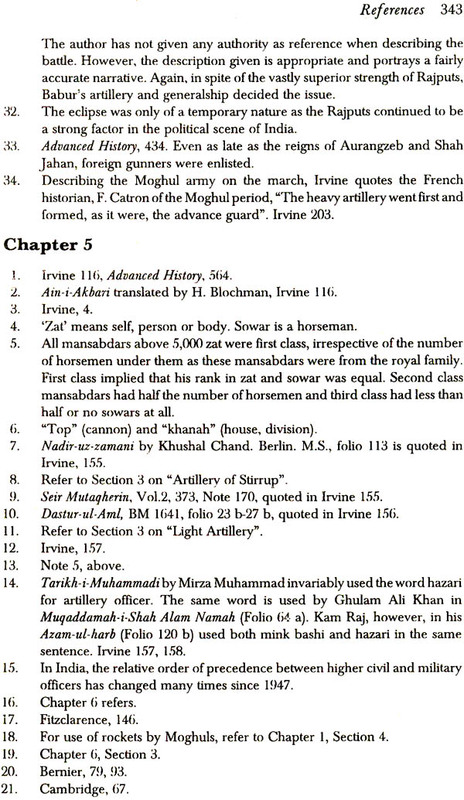 The statement of Irvine is not wholly true in that, at certain stages of the evolution of Indian armies of the Mughals, Marathas and Sikhs, they had excellent artillery in quality of equipment and ammunition but failed again in battle due to lack of comprehension of the exact role of this particular arm in various operations of war. They failed to understand that the two basic requisites of warfare are firepower and manoeuvre represented by artillery and cavalry/infantry respectively and that these two requisites have to be applied in the right quantity and at the right time. Although both Mughals and Marathas had ceremonial artillery pulled by horses, they did not raise any horse artillery units for warfare. It was only Ranjit Singh who understood that horse artillery, with its inbuilt characterisation of firepower and manoeuvre, could be very formidable in battle. The Marathas had managed to raise their artillery and infantry on a European pattern under foreign specialists but they went to the other extreme and relegated their cavalry to the background. Thus while artillery caused great destruction to the British at the crucial Battle of Assaye, their cavalry failed to exploit the devastation caused by their guns on British artillery and infantry. The performance of Sikh artillery in all the Anglo- Sikh wars was praiseworthy, but after the death of Ranjit Singh the Sikhs were unable to match the British artillery. 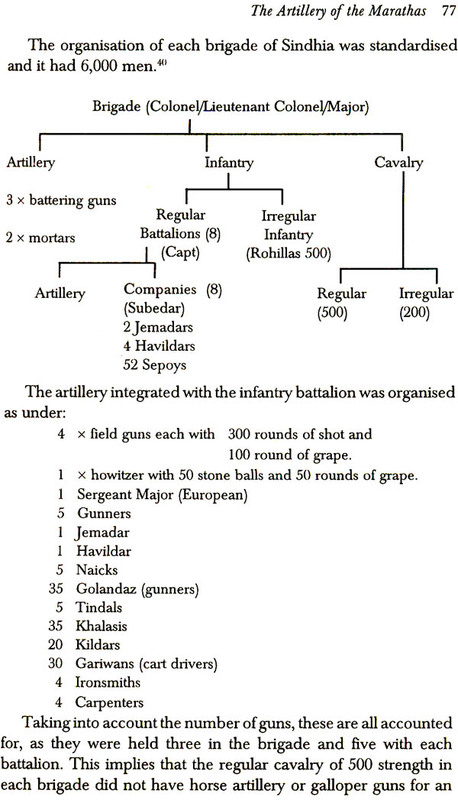 At the final battle at Gujrat they had 86 entrenched guns while the British had 92 which were deployed over open ground. Lack of fire control and discipline made them open fire too early thus giving away their position and getting neutralised by British guns. The subsequent fire fight was almost a walkover for the British. The Sikhs not only lost this battle but also their empire due to the inept handling of their guns. (a) Our tremendous cannonade at Plassey against a body of 50,000 men for a whole day combined with the bravery and endurance of Clive's small army truly decided the fate of India, and without the action at Gujrat, we may never have possessed Punjab." (b) The Battle of Plassey from the commencement till the final advance to storm the entrenchment was almost an artillery engagement. It decided the issue." (c) To the splendid arm of artillery to whose irresistible power I am mainly indebted for the Glorious victory of Gujrat. N ever was its superiority over that of the enemy irresistible and annihilating power more truthfully shown than in this battle. The British were extremely sensitive to their artillery being handled by Indians. Thus they kept firm control of the artillery arm throughout their period of power and ensured that Indian powers were kept ignorant of the art and science of this arm. 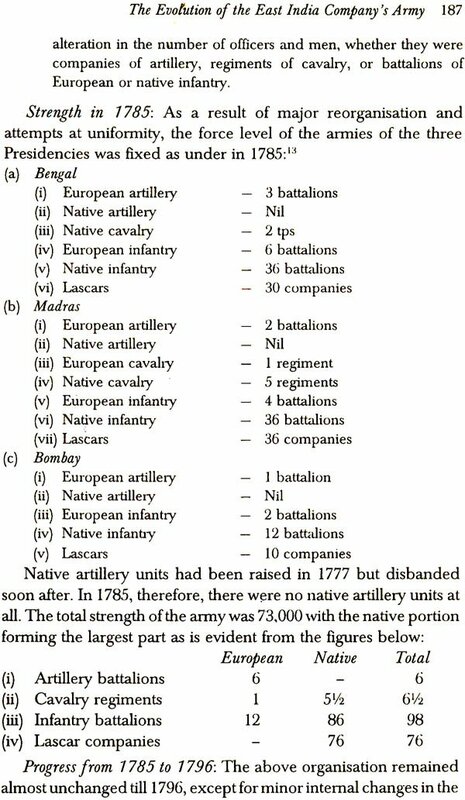 The cavalry and infantry branches of the armies of the East India Company were predominantly manned by Indian or native soldiers, the ratio to European soldiers sometimes being as high as ten to one. When raising their regular armies in 1748, the Directors in England had specifically laid down that no Indian was to be admitted to their artillery or to be allowed to know about its other aspects. They were so sensitive to this arm that they did not permit even their own people such as Roman Catholics and other Europeans of doubtful loyalty to man their guns. Till 1857 their artillery continued to be manned mainly by Europeans. Despite their compulsion to raise more artillery units and induct natives in them, having raised Golandaz units they periodicially reduced and disbanded them. Further, although there was a shortage of European manpower they still ensured that European manned units were in a majority. The British had to depend on their artillery not only during war but also during peace to quell unrest and mutinies. Their faith in the artillery's battle winning factor was so much that for the first' 50 years, they hardly raised any cavalry and won all their victories by artillery and infantry alone against Indian powers (who had overwhelming strength in all three arms and particularly in the cavalry). This itself is a fascinating subject and the current study has attempted to analyse it as far as it related to the role of the artillery, in the various battles fought between 1757 and 1857. On the eve of the Revolt, the artillery of the British was mainly manned by them. So good was the standard of loyalty and discipline of native artillery from the British point of view, that of all three arms, the native artillery, was the one that was least affected by the Revolt and the number of units which went across to the other side was minimal. It does not require any major research to guess at the likely outcome of the Revolt if the artillery arm of the British had been predominantly manned by natives or if native artillery units had also revolted in large numbers as had happened in the other two arms. The policy of keeping 'firm control of the artillery not only helped the British to conquer India but also ensured that they retained power. After the Revolt, the Indian-manned artillery was totally disbanded and other than four mountain batteries for defence of the frontier it was controlled by the British till as late as 1935 when Indians were accepted again. The Expert Committee on reorganisation of armies after the Revolt categorically 1. ud down that "In no way in future should the natives of the country be entrusted with British Artillery, nor should any native of India be entrusted in the use of such dangerous weapons." I am grateful to the Indian Council of Historical Research for granting me a research fellowship which gave me an opportunity to cover an important lacuna in the history of India, particularly relating to the military aspect which has generally been neglected by our scholars. My thanks are due to Dr. P.N. Chopra who was Chief Editor of ICHR when the fellowship was granted. I am particularly grateful to Dr. Raj Kumar, Senior Research Officer of ICHR, for his continuous guidance, assistance and advice. Dr. S.N. Prasad, joint Secretary, War Studies Division, Ministry of Defence, gave me valuable advice before the commencement of the project which ha: helped me to a great extent in its smooth working. I am highly appreciative of the courtesy and efficiency of the officers and staff of the Research Room of the National Archives of India, the National Museum at Delhi, the United Services Institute, Delhi and the library of the Ministry of Defence. 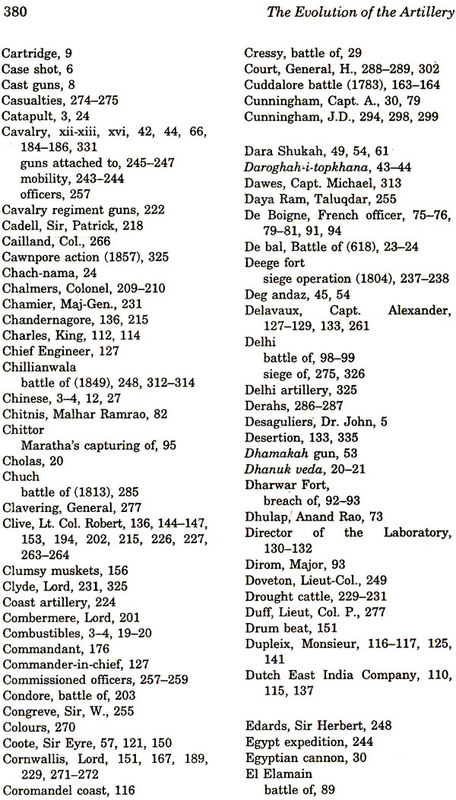 Heads of artillery in army commands located at Calcutta, Lucknow, Pune and Chandigarh have helped me in locating certain references in the local archives which were extremely useful for the study. General P.P. Kumaramangalam, D.S.O. and Lieutenant General K.P. Candeth, P.V.S.M., both' eminent artillerymen of India, gave me extremely valuable advice before I started the project. This helped me greatly in carrying out my subsequent work. Since it was not possible for me to visit the United Kingdom to check certain references available only there, Major General B.P. Hughes, GB., GB.E., the noted military historian of England and author of many books on artillery, helped me not only with advice but also by giving references of authorities requested by me. His encouragement has been a great sources of strength to me in carrying out this project. The typing of the many drafts was done by Shri N.C. Nair with his customary efficiency, accuracy and good cheer. My thanks are due to him for all his hard work. The scope of the current study and the research which was originally to cover the period from 1757 to 1857, had to be expanded to take in the period prior to 1757 so as to make the study complete and comprehensive. It was felt that without delving into the previous period the research would have remained rather disjointed. 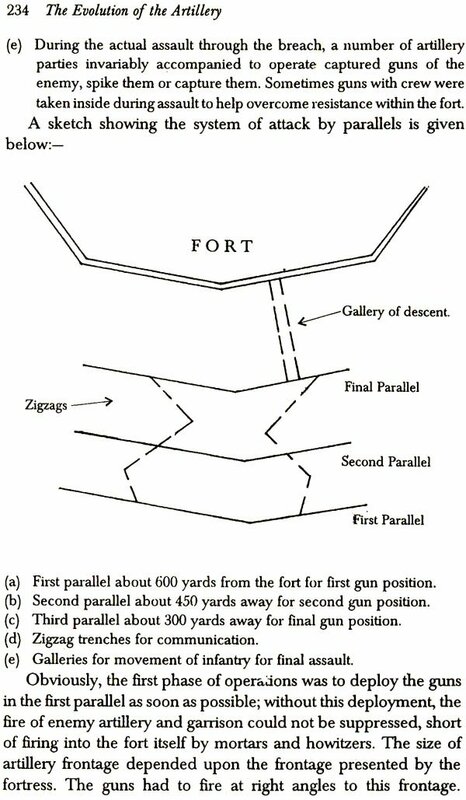 On approval of the current project, I propose to conduct further research on the subject and bring out a book which will include sketches, maps, photographs and more details of battles covering the period from ancient times to the Revolt of 1857 as far as it relates to the history of the artillery and allied weapons. Such a book will, I hope, be of interest not only to students of history in India, but also to military historians outside the country.